This is the second part of our lesson on the best aggressive chess openings for Black. In the previous article, we discussed about the openings “Sicilian Najdorf” and “Two Knights defense” against White’s first move 1.e4. If you missed it, you can find it here. Now it’s time to analyze something for the more strategic/positional move, 1.d4, which is the introduction to closed openings. By the term “closed openings” I mean that White or Black usually cannot open the position early in the game. This is very logical because behind the e-pawns are the respective kings, so both sides need to bring their rooks to the e-file in order to play e4 or e5. By the first move, 1.d4, White would like to limit Black’s options in the center, play more safely and control the position without many tactics. For that reason, it’s important for a club player to choose an aggressive opening for Black in order to activate his forces quickly and create problems on White’s center. This is the starting point from the Grunfeld defense. There are two basic strategies in order to fight for the center as Black. You can try to grab your own space like 1.d4 – d5, or you can give up the center and try to attack it with your pieces and pawns. The main idea of Grunfeld is to counter-attack the White’s center. 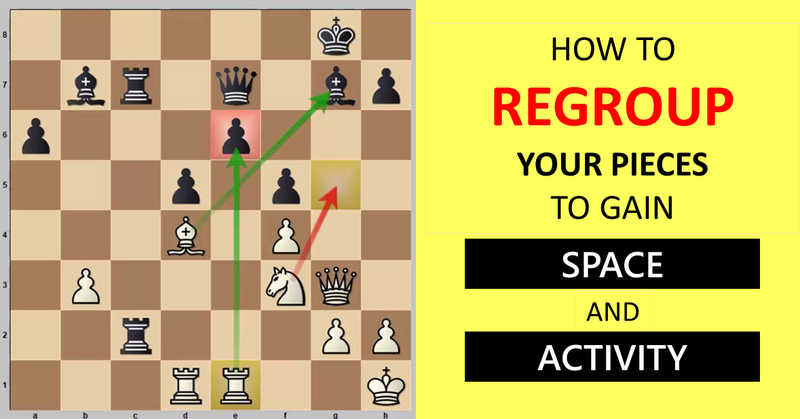 This is a very effective method which almost all of the best chess players had used. After some forcing moves we can see the basic position in the above diagram. Yes, White has the “perfect pawns” on e4 and d4, but the space advantage and the advanced pawns needs protection. It is White’s duty to defend these pawns so he will place his pieces in defensive positions. Black can play this position very easily because he can castle on the kingside, play Bg4, Nc6, Qa5 and Rd8. This is almost an automatic plan and we can apply it in almost all variations of Grunfeld. Last but not least, please let me share with you a very interesting idea. Grunfeld defense is a very aggressive opening, as Black is fighting for the center and he can complicate the position; however, the key idea is that we have queenside majority. After the forcing exchange cxd4 and cxd4, Black will be left with two queenside pawns (a7 and b7), but White has only one pawn, on a2. Having said that, Black is always happy to go in the endgame and start promoting these pawns. Making things even easier for you and we already had done all the hard work! A few months ago we created an opening chess course for Grunfeld defense with the top Turkish player GM Alexander Ipatov and myself (GM Igor Smirnov). 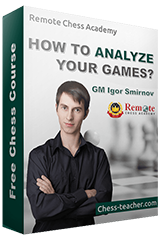 You can deepen your knowledge further on this opening with the course “Master the Grunfeld Defense as Black”. This is the starting position of the Slav defense. If you don’t like to give up your center, then Slav defense is the best opening for you. You can protect very well your d5-pawn and build the position behind it. When you develop all of your pieces, then you have the opportunity to break the center with the moves e5 or c5, based on your choice. The main difference between Slav defense and Queen’s gambit accepted is that we are not blocking the light-squared bishop from c8. Every 1.d4 player knows that he should play against this c8-bishop particularly. In general, Black has some problems to development actively this bishop in almost all defenses against 1.d4. This is a huge advantage of Slav defense; it gives you the opportunity to develop this c8-bishop directly by keeping free the diagonal h3-c8. I’ve selected two games for you and I hope you’ll like them. Good note, Jonathan. It’s hard to play actively against London system. It is a bit dull for both sides actually. You may play ‘normal’ opening usually, and turn to your set of ‘anti London’ openings if your opponent plays London all the time. Once I’ve seen an interesting plan against London system. Black player fianchettoed his queen-side bishop, and developed his minor pieces (but didn’t castle). Once White castled – Black played Rg8, g5 and stated a sudden attack of White’s king. White’s dark squared bishop is usually placed on g5 or f4, which will give few extra tempos for your pawn assault. It’s a sharp plan of course, but it may be really unpleasant for a White player (who was hoping for a solid game). outstanding igor sir you are grat taeacher.what do you think about garry kasprov saint louis rapid and blitz performance do oyou get a chance to play against him? ?thanks in advance. Why do you consider the Slav to be an “aggressive” response to 1 d4? Does it not have a reputation as being more solid and even drawish (if White wants a draw)? If White trades pawns on d5 early in the game – then it makes it drawish indeed. In most of the other lines Black has plenty of options to complicate the game and play actively. Finally, while playing Black against 1.d4 it’s hard to play aggressive in whatever opening you choose 🙂 That said, slav defense is pretty aggressive. dear sir great article ncie one keep it up.thanks for this one i totally agree with jonathan and wingscum comment why slav is considered to be agressive option in d4 ? ?london system is hugely popular as white in gm level yesterday i had seen kasprov usning gruenfeld defense as black in rapid and blitz event in saint louis against nakamura!!! !